At least I thought I had, anyway. I really don’t do classes or workshops or anything much anymore, so I don’t have much need for bajillions of stamped samples each new catalog and new mini-catalog. But then came Jami’s swap. I caved. A couple of full cards in a small quantity? I could certainly do that! Now that swaps have been returned, I can share what I created for the two small rounds I participated in. Thank you for a wonderful swap, Jami! If you’d like to see what the other swappers created, click here. 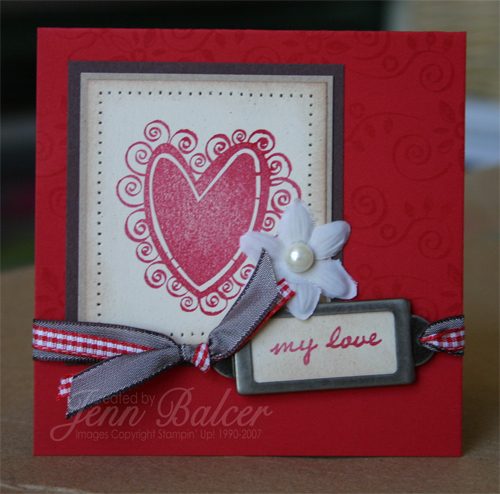 Here’s the first one, a 4 1/4″ square card using the new Heart Flutters set. 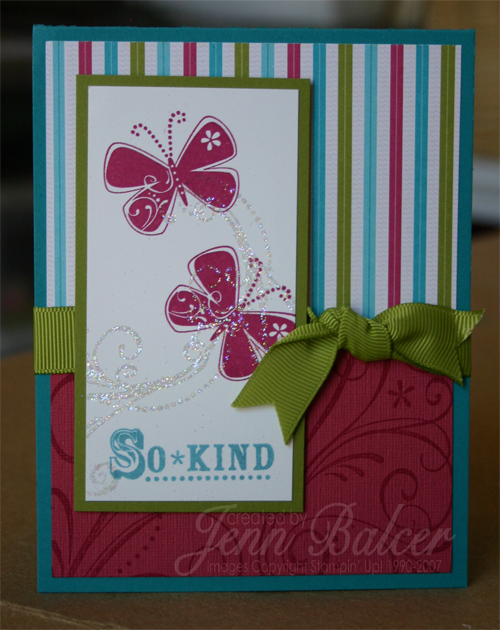 Here’s the second (and last) one, a regular sized, top folding card using the Confetti Scrappin’ Kit and Priceless. Some of these were stitched . . . . I hadn’t yet figured out *not* to thread the bobbin ribbon through the needle, so I had tons of jammed threads, and finally just sewed with no thread! And dang, I should have adhered the hardware and not just left it hanging. It looks wonky here! That butterfly card is just beautiful! Love the glitter!!! Your swaps are awesome! Love them both! What a great group of swappers! Your cards are awesome! I love the glitter that you use! Why don’t you do workshops or camps any longer? Hope your day is a great one! Soooooo, we might need to work out a “deal” … *wink*wink*! I am in love with these swaps, Jenn! I’ll need to take a pic first before I can upload .. but I am pretty stuck on staring at these for now! Wow! Ooooh isnt that wide grosgrain just the MOST fab!?!? I cant use enough of it!! I *need* all the colors! Just got my Olive last week-mmmmm! Love these cards Jenn! I got the bottom one in the swap-SUPER lucky me!! both cards are wonderful, but that second card just send my heart a flutter!! WOW!! Between you and Beate, I have now decided I HAVE to have the Priceless set!! These cards are just incredible. Looks like a wonderful swap to be in. Thanks for sharing them with us. Wow, gorgeous cards again. I think I might need that priceless set now. Jenn, your swaps look amazing. I am off to check out the rest of the swap cards! Hugs!!! I think it is simply AWESOME!!! Wowee! I love these, especially the 2nd one. Jenn, you’ve just got it goin’ on with the colors here…yummy! ohhhh…..I *love* that Priceless card!!!!!!!!!!!!! I love this card, Jen. I have the new Season of Joy set and I used your layout and idea for a card using that set and the new Christmas designer paper. Check out my blog http://www.stampinchick.blogspot.com to see my sample. Thanks. Lucious cards, they really showcase the new stamps!! TFS.